When you choose to adopt a specific breed, it’s always necessary to educate yourself. This is why we’ve provided the most useful knowledge about the boxer breed below—so you can make the best decision not only for you, but your future best friend as well. Be sure to consider the traits you look for in a canine companion as you learn more about this very special breed. Boxers are regarded for their love and protectiveness of their human family, and desire attention, love, and a lot of fun play in return. They are sociable and good-natured, and tend to use their paws in cat-like motions. Boxers are well-known for their boisterous energy levels, and are affectionately referred to as “the clown” of dogs. If you are looking for a lazy lapdog, this is not the breed for you - like many dogs, boxers require a lot of exercise and love. Boxers will rush to protect their house and family, but should not be utilized as a protection dog unless highly trained. As a bonus, they will lovingly follow you around everywhere you go; boxers are very family-oriented and loyal. As with children, more intelligent dogs will find more ways to get into trouble than less intelligent breeds. Boxers require obedience training to keep their curiosity satisfied and their intelligence challenged. While boxers need much outdoor exercise, their short, tight coats mean lower tolerance for cold temperatures; additionally, their short muzzles make them susceptible to high heat. They are not meant to live outside by any means. Boxers need lots of love, exercise, and attention. It’s best for you, your dog, and your home to start basic obedience training at a young age. 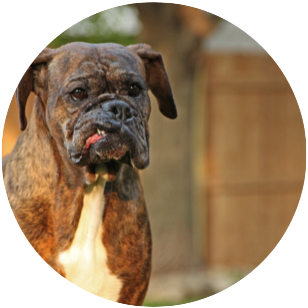 Boxers live 10-12 years, and may be prone to the following health problems: heart murmurs, skin tumors, digestive problems, and hypothyroidism. Some boxers [particularly those with loose lips] might drool, or pass gas, but this is not always the case - simply dependent on the individual dog. Like people, no two boxers are exactly alike.